Here are some notes for anyone attempting to install Xubuntu 16.04 on a Sager NP8952 laptop (Clevo P950HR). Most things work well enough. The initial installation onto the primary SSD along side Windows 10 was uneventful, from a live USB created with unetbootin. CPU frequency scaling – seems to work with Intel p-state driver after some fiddling. There were times when the driver unnecessarily kept the CPU frequency at maximum, so I tried a variety of fixes including installing and configuring laptop-mode-tools, xfce4-indicator-plugin, cpufrequtils, and perhaps others. Not using cpufreqd, nor tlp. cpufrequtils is currently disabled in /etc/init.d/cpufrequtils. Frequency scaling seems to be working now and I’m no longer sure which tweaks were necessary. External monitor – works with HDMI. Keyboard backlight – permanently on, steady blue, no way to control it. Keyboard hotkeys – some work: screen brightness, volume, suspend, external monitor, and others. Nvidia proprietary driver – works (384.90). Shutdown – (1) use “systemctl edit cups-browsed.service” to reduce the CUPS timeout to a few seconds as described in https://askubuntu.com/questions/760952/slow-shutdown-on-ubuntu-16-04-lts-stopping-thermal-daemon-running-fit-make-remo; (2) add acpi=force to linux command line to allow shutdown to finish. Sleep/restore – the headphone jack is inoperative after suspend/restore. Sound – (1) the speakers were muted at first: use alsamixer to unmute the speakers; only need to do this once; (2) the headphone jack is inoperative after suspend/restore. You can get a copy of my conkyrc file here. Just rename it to .conkyrc. During the life of this blog, I have had to read and discard about 120 spam comments for every one legitimate comment received. Most of the comment spam is entered by humans working for pennies in developing countries. The old captcha didn’t slow them down at all; it wasn’t designed to. For now, experimentally, comments are welcomed. Neural2d is an open-source neural net simulator with features for image processing. Here are some notes for anyone else attempting to install Xubuntu 14.04 on a Sager NP8268-S laptop (Clevo P150SM-A). The installation along side Windows 7 went fairly smoothly and the end result is a beast of a machine. 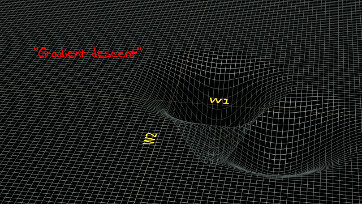 But there were a few rough spots, documented below. What was Stephen Hawking talking about when he said there are no black holes? Here’s an explanation for the non-scientist. Click the icon below for a PDF version of the article. Right-click and Save-As to save a copy. In 2013, the media picked up a technical presentation by Stephen Hawking in which he stated that “There are no black holes.” That’s a curious viewpoint from someone who spent much of his career working out the physics of black holes. Unfortunately, the rest of Hawking’s presentation was too technical for the media to touch, leaving the general public in need of new mental images to replace all those missing black holes. 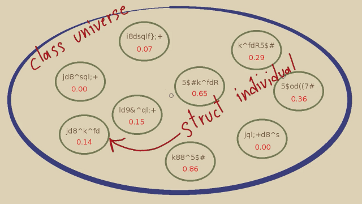 This paper is an informal discussion of the technical parts of Hawking’s paper without undue jargon and math. Update: New in Blender 2.64 — For randomizing material properties, the new Object Info node and its random number output could be an alternative to the driver technique described in this video. 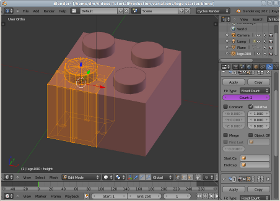 This tutorial shows how to attach random number drivers to selected properties to make endless variations of an object in Blender 2.62. This video is for the intermediate Blender user who already feels comfortable with the Blender UI, but no prior experience is expected with drivers or Python scripting. I’ll do my best to show you not just what buttons to click, but why. 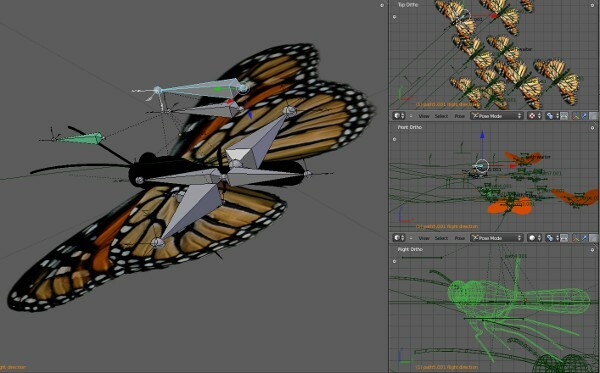 Below is a screenshot of what the butterfly model looks like in Blender. One bone in the armature is a control bone that drives the wing flap movement, and another bone controls the angle of the legs that dangle under the body. I created an action in the action editor for one cycle of wing flap, much like you would animate a walk cycle in a critter that walks, and then spread some flapping actions on the timeline using the non-linear action editor. 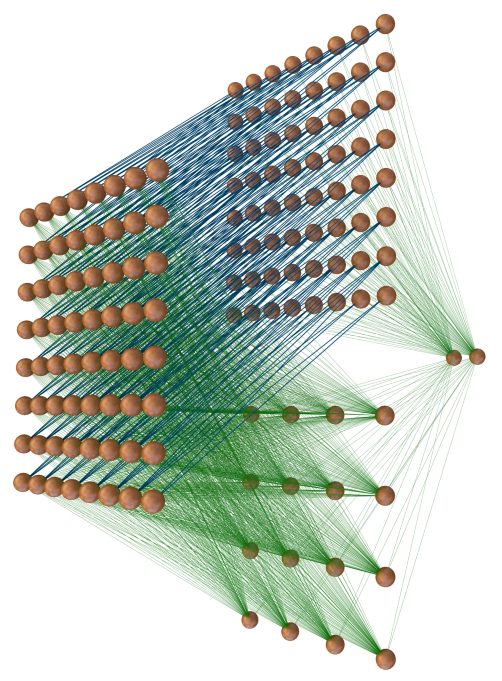 Each butterfly object is parented to a path object that defines its flight path. 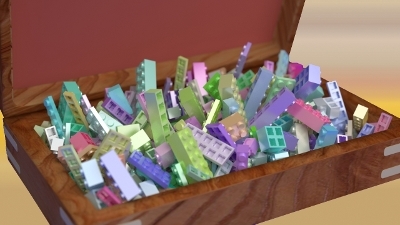 The grass in the video background uses the Blender particle system to define how the clumps of grass will appear. Each grass blade is a simple mesh object, with five different grass blade textures UV-mapped onto a group of five slightly different grass blades. The little bush in the foreground was made and animated using Blender’s Sapling plug-in. The music was composed using Rosegarden to edit the score and mix the tracks, and Timidity for synthesizing the instruments. The comment form is disabled because of the amount of spam we’re receiving. To post a comment, send email to dave at millermattson.com. This tutorial shows how to use normal-mapped gradients as layer masks in Blender. It’s a quick way to splash one texture onto the steep surfaces of your model and a different texture onto the more horizontal surfaces. 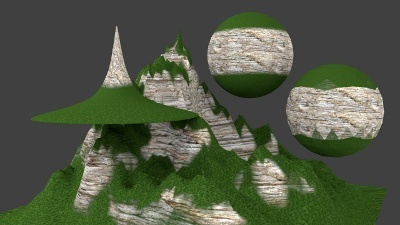 You can use it, for example, to put a rocky cliff texture onto the steep surfaces of a terrain mesh, and a green grassy texture on the less steep parts. In this short tutorial, we’ll use four simple objects to show how the technique works and how to set it up. If you just want the quick summary of the essential settings for the gradient mask, just skip to the final three minutes of the video for the recap. Happy Blending!